By Chris Williams: Manny Pacquiao expressed interest in facing IBF welterweight champion Errol ‘The truth’ Spence Jr. last Saturday moments after his win over Mikey Garcia at at AT&T Stadium in Arlington, Texas, but that doesn’t mean the fight has an iron lock chance of happening. The fights are already there that the fight won’t get made. All one had to look at how less than excited Pacquiao, 40, appeared when he was inside the ring being asked by Spence if he would like to face him next. The only thing Pacquiao could say is, “yes, why not.” You can bet that the negotiations between Spence and Pacquiao could quickly derail if they ever start to begin with. Floyd Mayweather Jr. is the one that Pacquiao (61-7-2, 39 KOs) is interested in fighting next, and all he has to do is give the word, and Manny look to make the fight with him and forget about Spence. Pacquiao is no longer with Top Rank Boxing any longer, but that doesn’t mean that we still won’t see the Spence negotiations spin on endlessly to the point where the IBF 147 lb champion is forced to go in another direction for his next fight this summer. Spence can’t afford to devote the remainder of 2019 trying to put together a fight against Pacquiao if he’s dragging his feet in the negotiations endlessly. Spence has only been fighting two times a year, which would be fine if he was making the kind of money that superstars Mayweather and Saul Canelo Alvarez, but he’s not. Pacquiao entered the ring last Saturday after Spence’s 12 round schooling of the overmatched and undersized Garcia (39-1, 30 KOs) at AT&T Stadium in Arlington, and displayed some half-hearted interest in fighting Spence. When Spence asked Manny if he wanted to fight him, he didn’t say no, but the way he said, “Yes, why not?”, it reeked of someone that isn’t going to take the fight.“We’ll give the fans a good fight,” the former eight division world champion Pacquiao said. Spence should obviously take look at other back up options in case the Pacquiao fight fails to take place. A unification match against WBO welterweight champion Terence Crawford would be an ideal fight for Spence to take for his next match. The entire boxing world would love to see Spence and the unbeaten #2 pound-for-pound star Crawford (34-0, 25 KOs) battle it out for the welterweight supremacy. Spence, 29, says he wants to be the #1 pound-for-pound fighter in the sport. Well, the best way for Spence to accomplish that goal is to defeat #2 guy in Crawford. Lightweight champion Vasiliy Lomachenko is #1 on the pound-for-pound list, but he looks like he’s slipping, and starting to show signs of age and wear and tear. Spence can easily surpass the 31-year-old Lomachenko by beating Crawford, who is also 31, and starting to look very beatable. Crawford looked nothing special in his last fight in defeating Top Rank promoted fringe contender Jose Benavidez Jr. Crawford looked frail, and not sturdy for a welterweight. Spence could very easily walk Crawford down and take him out the way he’s done other opposition. Spence obviously shouldn’t get into a boxing contest with Crawford like he did with Garcia, 31, last weekend. That would be a mistake. That’s not to say that Spence couldn’t still win fighting like that against Crawford, but he would make his job much more difficult, and he would be giving the former light welterweight unified champion his best shot at beating him by getting outside of his normal game. Unfortunately, Ringstar promoter Richard Schaefer reportedly doesn’t see a fight with Spence and Crawford taking place until 2020. Schaefer says that if the Pacquiao fight doesn’t tae place for Spence, then he would look to match him against World Boxing Council welterweight champion Shawn Porter, WBA champion Keith ‘One Time’ Thurman or former two division world champion Danny Garcia. 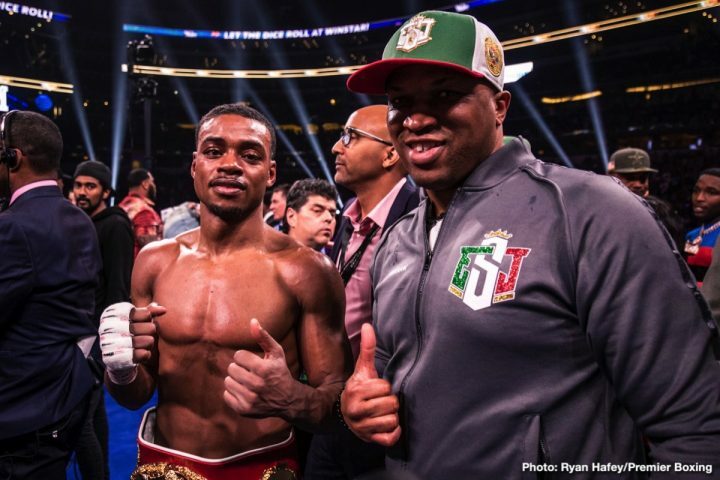 Although none of those guys are as popular as Pacquiao, and none are in the top 10 pound-for-pound list, they would still be excellent options for Spence to fight in his next fight. As long as those fighters don’t have to be dragged kicking and screaming into the negotiations with Spence, any one of them would be great choices for ‘The Truth’ to fight this summer in a pay-per-view contest on Fox Sports or Showtime. Porter said he wanted to fight the winner of the Spence vs. Garcia fight. Now might be a good time for Schaefer to speak to Porter to see if he was serious about really wanting to fight the winner of that match or if his whole interest was only fighting Garcia. That’s what some people thing was the case. It was odd that Porter didn’t jump into the ring after the Spence-Garcia fight to call out Spence immediately after the fight the way that some fans thought he would do. Pacquiao has won his last two fights against Adrien Broner and Lucas Matthysse, but he looks like a shadow of the guy that he used to be. The way that Pacquiao labored to beat Broner, 29, last January in Las Vegas, he would likely have no chance of beating Spence. The more likely outcome of a Pacquiao-Spence fight would be for Pacquiao to be knocked out. However, Spence might be kind to the aging superstar Manny by choosing to box him for 12 rounds instead of jumping on him to bulldoze him the way he typically does in his fights. Pacquiao can probably still win fights against guys like Danny Garcia and Shawn Porter. It wouldn’t be surprising to see Pacquiao got that route to fight one of them unless Mayweather chooses to come out of retirement to face him. If Mayweather has been sitting on the fence about whether to come out of retirement to get some more of the Manny money in a rematch, the prospects of a Pacquiao-Spence fight might be the catalyst to make him finally take the fight. If Mayweather doesn’t fight Pacquiao now, it may not be worth it after he loses badly to Spence and is made to look like an old man. It would be too late for Mayweather to fight Pacquiao again at that point, as the Filipino star would be viewed by a lot of boxing fans a washed up fighter.